New Delhi : Congress President Rahul Gandhi, who calls himself a devotee of lord Shiva, greeted the nation on Mahashivratri with a picture of mount Kailash attached to a caption, "On the occasion of Mahashivratri, my greetings to you all." The political party also shared two 'throwback' pictures - one clicked by Rahul Gandhi himself and the other, of him at a Shiva temple. In August 2018, Rahul Gandhi had gone to the Kailash Mansarovar Yatra to seek Lord Shiva's blessings. 12-day long pilgrimage was a follow-up on a vow to himself in April, when his plane had a technical snag and plunged several feet during the campaign for the Karnataka polls. "Shiva is the universe," Mr Gandhi had tweeted when he began his pilgrimage. The tweet was accompanied by a photo of Mount Kailash. Today, the Congress shared that image with this: "Shiva is the Universe". 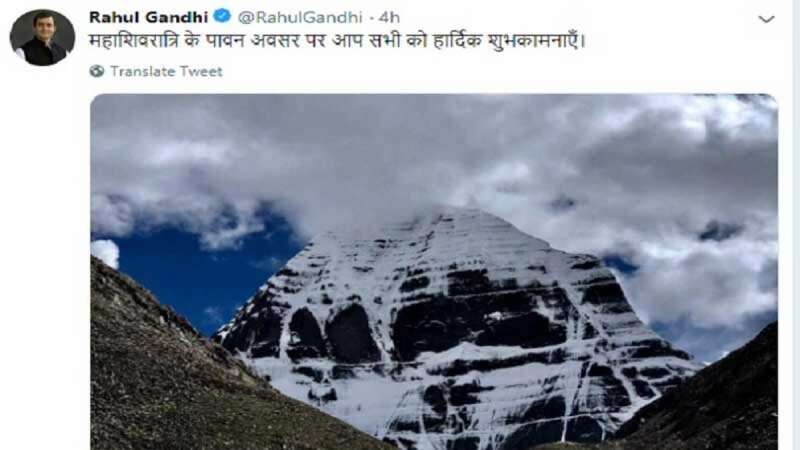 #Throwback to when Rahul Gandhi went on a pilgrimage to Kailash Mansarovar in Sept 2018." "A person worshipping you in whatever way, in whatever name reaches you just as the water of all rivers reaches the ocean," the Congress wrote on its Instagram account with a picture of Rahul Gandhi offering prayers at the Mahakaleshwar temple in Ujjain along with Madhya Pradesh Chief Minister Kamal Nath and close aide Jyotiraditya Scindia in October last year. In a year there are total 12 shivratris and one Maha Shivaratri. This year, it falls on March 4. Devotees of lord Shiva keep fasts and visit temples to offer their prayers. Majorly, the puja is done in the evening and milk is offered to shivlings across temples.